DEA is used as an emulsifier in shampoos, cleaners, and detergents. ,TEA is used as fragrance, pH adjuster and emulsifying agent ,. When ethanolamines are used in the same product as certain preservatives that break down into nitrogen, they can form nitrosamines. Nitrosamines are a class of more than a dozen different chemicals, which the International Agency for Research on Cancer lists individually as possible and known carcinogens. The National Toxicology Program Report on Carcinogens lists 15 individual nitrosamines as reasonably anticipated human carcinogens. 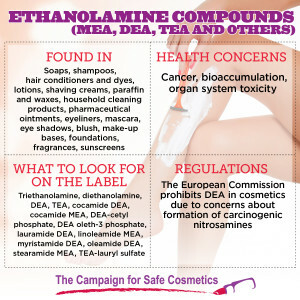 In cosmetics formulations, DEA may react with other ingredients to form a carcinogen called nitrosodiethanolamine (NDEA) which is absorbed through the skin. Cancer: Nitrosodiethanolamine (NDEA) is listed as a carcinogen in the National Toxicology Program’s Report on Carcinogens. Experimental studies show that NDEA causes liver cancer and kidney tumors in rats and cancer of nasal cavity in hamsters . TEA and DEA have found to be hepatocarcinogenic (producing or tending to produce cancer in the liver) in female mice ,,. Bioaccumulation: Studies show that 52 to 68 percent of DEA in hair dyes, body lotions and shampoos remain on the upper layers of the skin after exposure . Organ system toxicity: Studies have found that DEA affects human male reproductive health. DEA alters sperm structure, causing abnormalities that affect the sperm’s ability to swim and fertilize the egg . DEA accumulates in the liver and kidney, causing organ toxicity and also possible neurotoxic effects such as tremors . Another study suggests that memory function and brain development in offspring could be permanently affected by mothers’ exposure to DEA . HOW TO AVOID? 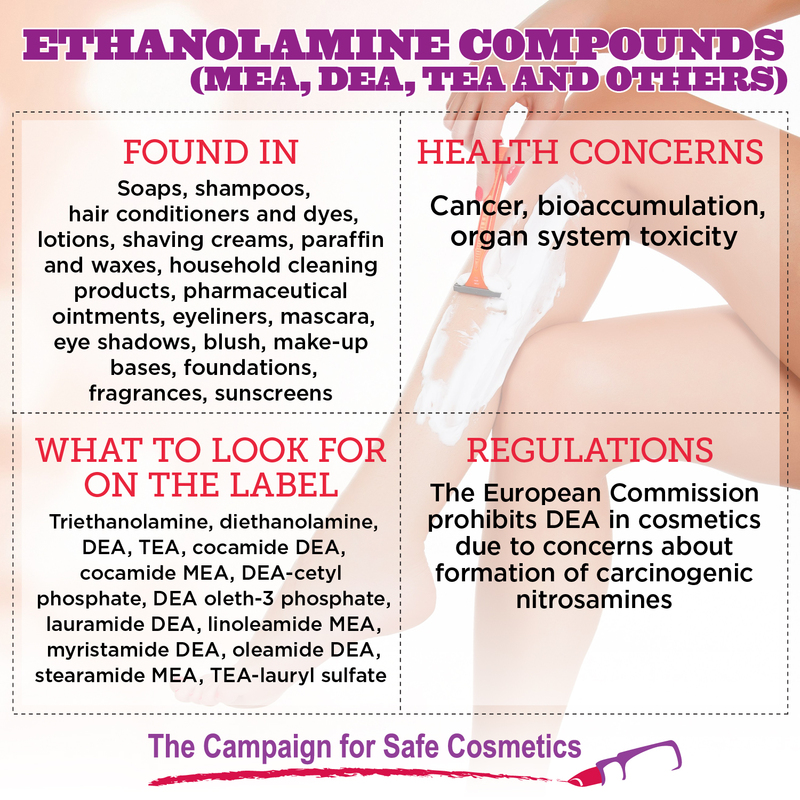 Read the labels on cosmetics, personal care products and household cleaning products, and avoid those containing with words DEA, TEA and MEA. Dodson, R. E., Nishioka, M., Standley, L. J., Perovich, L. J., Brody, J. G., & Rudel, R. A. (2012). Endocrine disruptors and asthma-associated chemicals in consumer products. Environmental health perspectives, 120(7), 935. Ingredient Watch List: Ethanolamines (MEA, DEA, & TEA)—Potential Carcinogens (2012). Available Online: http://www.annmariegianni.com/ingredient-watch-list-ethanolamines-mea-dea-tea%E2%80%94potential-carcinogens. Accessed November 5, 2013. Price, C. J., Marr, M. C., Myers, C. B., & Jahnke, G. D. (2005). Postnatal development of rat pups after maternal exposure to diethanolamine. Birth Defects Research Part B: Developmental and Reproductive Toxicology, 74(3), 243-254. Stout, M. D., Kissling, G. E., Suárez, F. A., Malarkey, D. E., Herbert, R. A., & Bucher, J. R. (2008). Influence of Helicobacter hepaticus infection on the chronic toxicity and carcinogenicity of triethanolamine in B6C3F1 mice. Toxicologic pathology, 36(6), 783-794. Triethanolamine Available Online: http://www.ewg.org/skindeep/ingredient/706639/TRIETHANOLAMINE/. Accessed November 5, 2013. Agents Classified by the IARC Monographs, Volumes 1–109 Available Online: http://monographs.iarc.fr/ENG/Classification/ClassificationsAlphaOrder.pdf. Accessed November 5, 2013. Report on Carcinogens, Twelfth Edition (2011) Available Online: http://ntp.niehs.nih.gov/ntp/roc/twelfth/profiles/Nitrosamines.pdf. Accessed November 5, 2013. Hepatocarcinogenic Available Online: http://www.merriam-webster.com/medical/hepatocarcinogenic. Accessed November 5, 2013. Lehman-McKeeman, L. D., Gamsky, E. A., Hicks, S. M., Vassallo, J. D., Mar, M. H., & Zeisel, S. H. (2002). Diethanolamine induces hepatic choline deficiency in mice. Toxicological sciences, 67(1), 38-45. Kraeling, M. E. K., Yourick, J. J., & Bronaugh, R. L. (2004). In vitro human skin penetration of diethanolamine. Food and chemical toxicology, 42(10), 1553-1561. Panchal, S. R., & Verma, R. J. (2013). Spermatotoxic effect of diethanolamine: An< i> in vitro</i> study. Asian Pacific Journal of Reproduction, 2(3), 196-200. Gamer, A. O., Rossbacher, R., Kaufmann, W., & van Ravenzwaay, B. (2008). The Inhalation toxicity of di-and triethanolamine upon repeated exposure. Food and Chemical Toxicology, 46(6), 2173-2183. Craciunescu, C. N., Wu, R., & Zeisel, S. H. (2006). Diethanolamine alters neurogenesis and induces apoptosis in fetal mouse hippocampus. The FASEB journal, 20(10), 1635-1640.